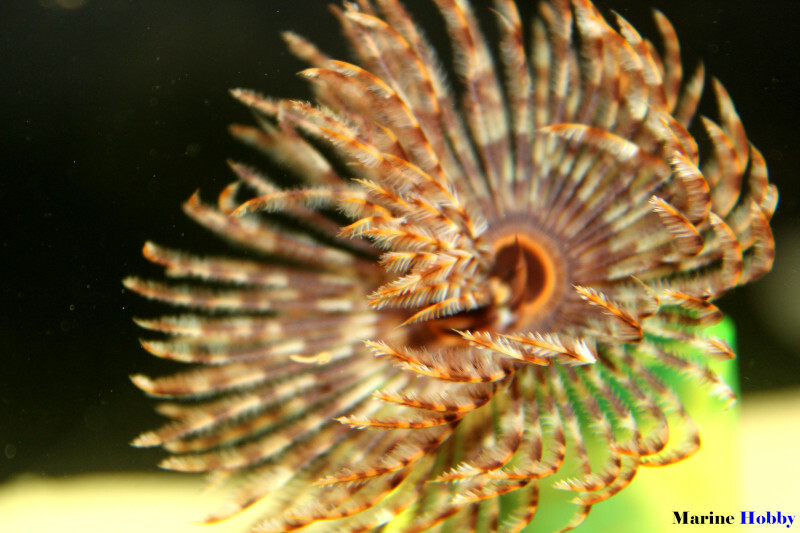 Feather dusters are one beautiful worm, that I can have in my tank. From the Indo-Pacific region with the size of 4 inches. These are just gorgeous fan or flower shaped worms. These are filter-feeders who feed directly from the water column. There are so many variations available that just makes them very interesting marine creature. They are literally like flowers they have the head and the stem which is the tube which they are hosting. As we touch or they feel stressed they just retract inside the tube instantly. Many of the fish we have in our tank are not good for these feather dusters. So, be clear that you don’t have a trigger or a butterfly variety in the tank. They do shed their feathers from the top and regenerate them in time. Too much of flow in water as placed mine very close to the wave maker is also not very great for them. The flower or the crown won’t come out in too much flow. When I first got this in my tank it won’t come out and both the ends look very similar. So, I waited for some time and kept it inside a plastic tube for me to find out which side is the top. Once I knew the up side then just buried it inside the sand giving it enough space for the fan to come out. Having feather dusters are fun in an any establish marine aquarium they add so much depth to marine life.